Winding Hole above Wightwick Lock is a minor waterways place minor waterways place place on the waterways major waterways place village town city on the Staffordshire and Worcestershire Canal (Main Line: Stourton to Aldersley) between Wombourne Bridge No 43 (4 miles and 6½ furlongs and 8 locks to the south) and Aldersley Junction (Junction of the Staffordshire and Worcestershire Canal Main Line with the Birmingham Canal Navigations Main Line) (2 miles and 5½ furlongs and 2 locks to the northeast). 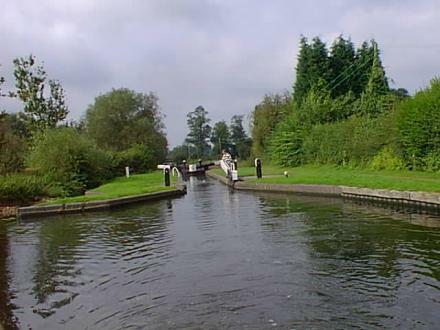 The nearest place in the direction of Wombourne Bridge No 43 is Wightwick Lock No 29; ¼ furlongs away. The nearest place in the direction of Aldersley Junction is Wightwick Mill Bridge No 58; 1½ furlongs away. Bridgnorth Rd, Wolverhampton, WV6 8BN — 311 yards to the west. 62 Ennerdale Dr, Wolverhampton, WV67PF — 1484 yards to the northwest. Wolverhampton — 1409 yards to the east. Wightwick Manor, Wightwick bank, Wolverhampton, WV6 8EE — 407 yards to the west. The stockings farm, Wolverhampton — 1362 yards to the southeast. Mount Rd, Wolverhampton, WV6 8HL — 611 yards to the north. 54 Woodland Avenue, Wolverhampton, WV6 8NE — 1190 yards to the northeast. Wolverhampton — 1414 yards to the east. Wolverhampton — 1423 yards to the southeast. Wolverhampton — 1456 yards to the north. Wolverhampton — 1627 yards to the southeast. Castlecroft Road, Wolverhampton, WV3 8NA — 1094 yards to the south. Wolverhampton — 1270 yards to the southeast. Paxton Avenue, Wolverhampton, WV6 7SG — 1518 yards to the northwest. Wolverhampton — 1416 yards to the southeast. 13 Finchfield Road West, Wolverhampton, WV3 8AY — 1336 yards to the east. 229 Castle Croft Road, Wolverhampton, WV3 8NA — 724 yards to the south. Wolverhampton — 1365 yards to the northwest. Windmill Lane, Wolverhampton, WV3 8HJ — 314 yards to the south. Wolverhampton, WV6 — 1341 yards to the northwest. Windmill Crescent, Wolverhampton, WV3 8HU — 389 yards to the southeast. Wolverhampton — 1301 yards to the northwest. Wolverhampton — 1455 yards to the northeast. 5 Viewlands Drive, Wolverhampton, WV68 — 178 yards to the north. 1 Finchfield Road West, Wolverhampton, WV3 8AY — 1301 yards to the east. Wolverhampton — 1452 yards to the east. Wolverhampton, WV6 8 — 1036 yards to the north. Wolverhampton, WV6 7 — 1612 yards to the northwest. 17 Mallory Road, Wolverhampton, WV6 7XN — 1637 yards to the northwest. 21 School Road, Wolverhampton, WV6 8EN — 1047 yards to the northeast. Tettenhall — 1204 yards to the north. Castlecroft Stadium, Wolverhampton, WV3 8 — 957 yards to the south. 26 Finchfield Road West, Finchfield,, Wolverhampton, WV3 8AZ — 1324 yards to the east. Wolverhampton, WV3 8 — 313 yards to the southeast. Wolverhampton — 1362 yards to the southeast.